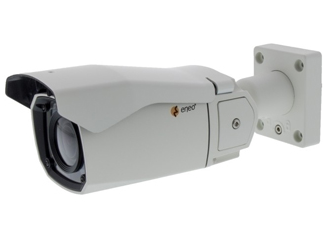 Eneo’s Candid bullet camera range uses a 2MP and 3MP, 1/2.8-inch Sony STARVIS CMOS sensor to provide video quality in low light. the makers say. There are three bullets in the range with built-in junction boxes: a 2MP, IP bullet (ICB-62M2712M0A) and a 3MP, IP bullet (ICB-73M2712MWA) with the newly-launched, WiFi set-up interface. A 2MP, analogue, multi-signal bullet (MCB-72M2712M0A) completes the range, offering selectable, HD-TVI, AHD, CVI, HD-SDI, EX-SDI and Composite video stream options. The bullet cameras have a rugged, aluminum construction, designed for outdoor applications, according to the company. They are weather proof-rated to IP67 and come with integrated, infra-red (IR) illumination and a motorised, 2.7mm to 12mm, varifocal lens. They will operate at a temperature of minus 20 degrees C, but have a built-in, low-energy heater which will extend the IP camera’s temperature range to minus 50 degrees C and the analogue cameras temperature range to minus 30 degrees C.